Full Steam Ahead For China's Rail Links Abroad? 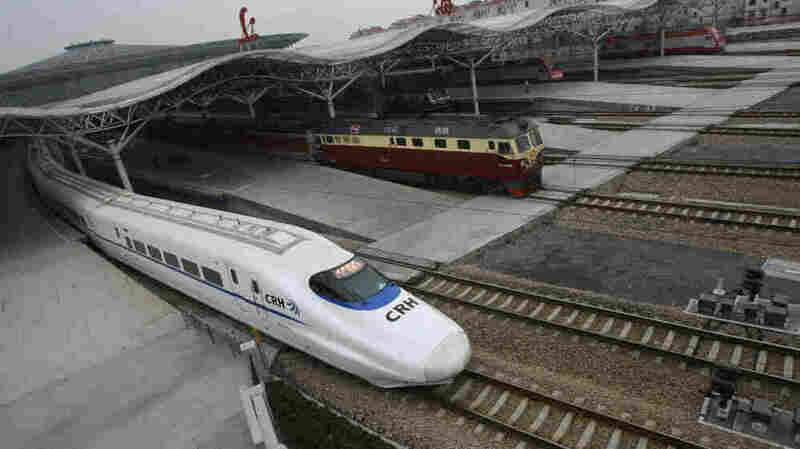 China has ambitious plans for expanding high-speed rail systems throughout Southeast Asia and to Europe. And though Beijing is offering to foot much of the bill, negotiating the politics of building the rail links is tricky. China's first project is to link itself to its Southeast Asian neighbors, so that rail travelers may soon be able to traverse Asia from China to Singapore in a day. The plan is for trains to make their first stop outside China in the border town of Boten in northern Laos. The zone's vice governor, Vixay Homsombath, is already counting the renminbi, or Chinese currency, pouring into the local economy. "Of course if the people come here, they should sleep in the hotel and eat here, and we can sell the food," he predicts while sitting at a restaurant on the town's main drag. "We can get the money from the hotel's rent and guest house rent." Right now, Boten is a ghost town. Vixay is hopeful that the trains will bring back the boom times, as well as the gamblers, tourists and workers who drifted away when the zone's casinos shut down last year after a string of gambling-related murders. 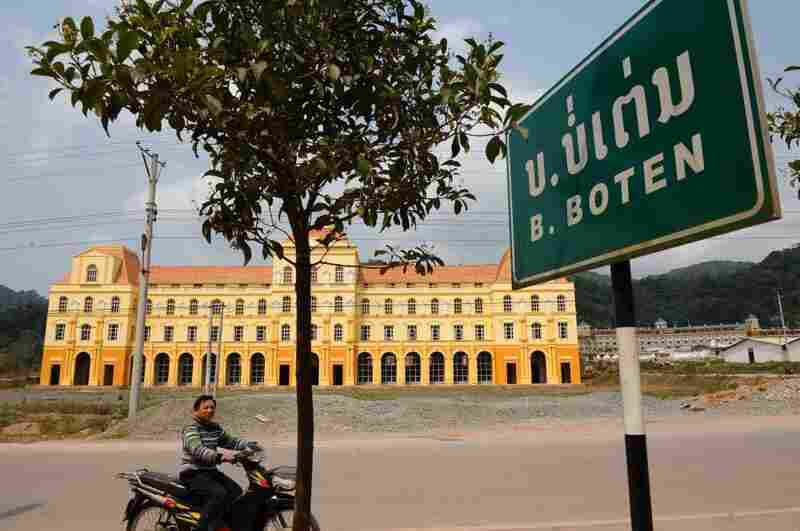 The town of Boten in northern Laos along the Chinese border will be the first stop for high-speed trains outside China. Local government officials hope the train will help boost the local economy by bringing tourists who will stay at hotels like this one, currently under construction. Most of the people, goods and money in Boten come from north of the border in China. Most everything needed for the railway will, too. Critics sometimes complain that Chinese infrastructure projects produce few jobs for the local economy, but Laotian officials lament that there's no other way. "We need a lot of skilled labor, and the Lao local people might not be able to do that," he explains. "So I heard that at the beginning there might be some need of about 40,000 skilled laborers to work on the construction sites." Laos is one of Asia's poorest countries. Its current railway system stretches for just two miles — enough to get from Vientiane over the Mekong River and into Thailand. Houmpheng says the Chinese-built railway can help the country overcome its isolation. "Laos has a vision of, as you know, transforming the landlocked country of Laos to the land-linked country." For now, the Namtha's coffee-colored waters flow as they always have toward the Mekong, with locals swimming and fishing in them. Much of the area is home to ethnic minority hill tribes, living in thatched huts and practicing slash-and-burn agriculture. But it's hard to find such debate or any indications of public opinion in Laos or its state-run media. Farmer and ex-village chief Souvanpheng Vongxay will have to move to accommodate the new railway, but he says he trusts his government to help him. "Everyone's happy about this project," he says, reading from prepared notes, with a government official standing next to him. "We support the government because this railway can help to make transportation to other provinces more convenient." A string of gambling-related murders last year left Boten a ghost town. Most of the people, goods and money in the town come from north of the border in China. The new rail link could revitalize the area. While relations between China and Laos' ruling parties are quite cordial, ties are not what they might be, because of China's historical interventions in Southeast Asia. In 1979, China launched a punitive invasion against Laos' main backer, Vietnam, after Hanoi aligned itself with Moscow and invaded Cambodia, overthrowing the Beijing-backed Khmer Rouge. Laos, Vietnam and the Soviet Union all accused China of undermining solidarity among communist regimes in Indochina. China and Laos did not normalize ties until 1988. 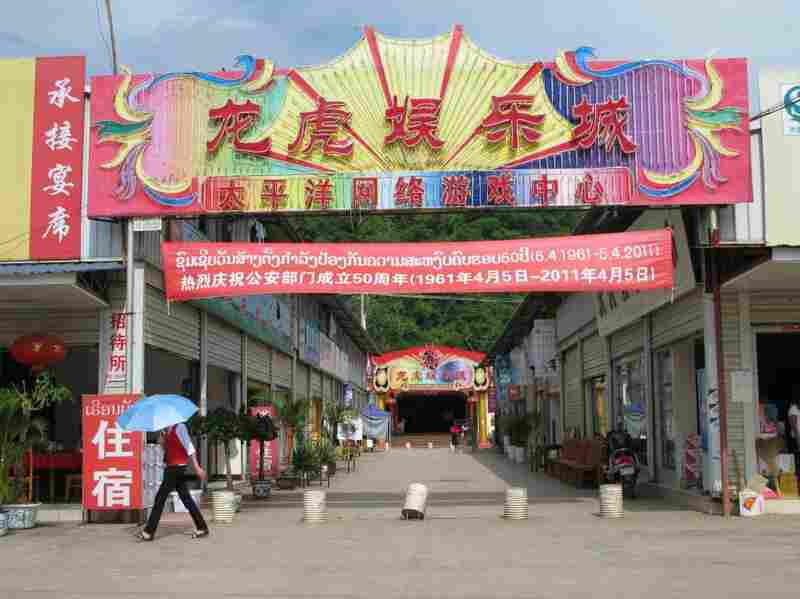 Ian Storey, a fellow at the Institute of Southeast Asian Studies in Singapore, says that since then, China's investments in Laos, such as mines, rubber plantations and hydropower dams, have helped China catch up with Vietnam in Laos. "Vietnam still has the inside track politically," he says. "It's still got much more influence in Laos than China. But over time that will probably change as China's economic role becomes more dominant." "I think if China really would like to have this system throughout Southeast Asia, they have to be successful in negotiating with the Thais," he argues, "because this can be the model for other countries. Laos is not the model." Thailand's trade representative, Kiat Sittheeamorn, says China and Thailand are close to reaching a deal, and he's optimistic that China can connect the various segments of the railway. "I believe China would do all they can in order to complete the line," he recently told reporters. "They already spent so much money building the railway all the way from the south to Laos — they clinched the deal with Laos already — it would be just shameful not to complete it all the way to Singapore." China is not the only one to dream of an "Iron Silk Road," crisscrossing the Eurasian land mass. The United Nations conceived of a trans-Asia railway network as early as the 1960s. But at that time, China was still in the grip of the Cultural Revolution, and war was raging in Vietnam. Plans for that trans-Asia railway lay dormant until the 1990s, when the Cold War ended and China's market reforms sped up, explains Pierre Chartier, a transport expert with the United Nations Economic and Social Commission for Asia and the Pacific, or ESCAP. "All this suddenly created a huge boom in international trade," he says, speaking in his Bangkok office. "And then the countries in ESCAP decided it was time to equip the region with a transport framework able to accommodate this new international trade." But experts are far from certain about whether or when China can actually bring its ambitious plans to fruition. Xie Weida, a railway expert at Shanghai's Tongji University, says building the railway itself may be the easiest part. "I could perhaps talk about it from a technical standpoint," he says, "but in my opinion, whether or not the railway is built or not depends on other factors. One is political, another is economic, and there might even be some military factors involved." Economically, China's vision for the rail network is one of regional integration. At present, China does more trade with the West than it does with its own neighbors. The railway will help China bring commodities back from Southeast Asia, get its goods to far-flung markets and accelerate the development of China's relatively backward southwestern Yunnan province. Strategically, China seeks a continental "back door" in case of any maritime blockade. In particular, a railway into Myanmar would give China access to the Indian Ocean and allow it to bring oil supplies up into its southwest without going through a vulnerable choke point in the narrow Straits of Malacca. It will be a great test of China's diplomacy to get all of its neighbors to agree to its terms, so that one day all railroads will lead to Beijing.